About OYRGS: The Old York Road Genealogical Society (OYRGS) was formed in 1978 and meets at the Abington Free Library. About the Old York Road: The Old York Road runs from Philadelphia to New York. Originally an Indian trail, it played a part in the Revolutionary War and the Civil War, when it was one of the main routes of the Underground Railroad. Old York Road runs from Philadelphia (where it's known as Broad Street) to New Hope in Bucks County; many historic buildings sit on its sides, attesting to its importance. To instruct members in genealogical research, encourage careful documentation, and promote quality genealogical standards. To assist through joint and individual effort with particular research problems of members. About our logo: Why a crane? 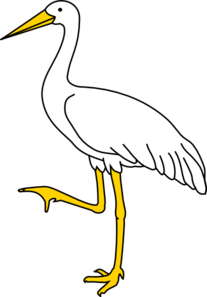 Here's the answer: Someone centuries ago fancied that the lines of a blank genealogic chart resemble a crane's footprint: The lines fan out like toes as the number of individuals in each generation increases. The Old French words for a crane's foot is “pie de grue”; in English “pie de grue” soon became pedigree. How to reach us: If you have any questions about the OYRGS, e-mail us.